The Corte Madera Volunteer Fire Department Ltd. 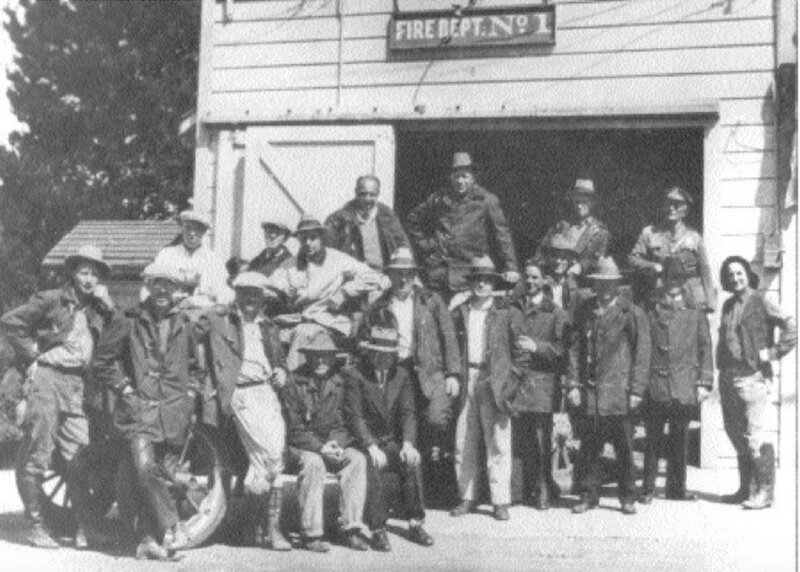 The History of the Corte Madera Volunteer Fire Department Ltd., starting in 1908 and in formal existence from 1910-1975, full story coming. 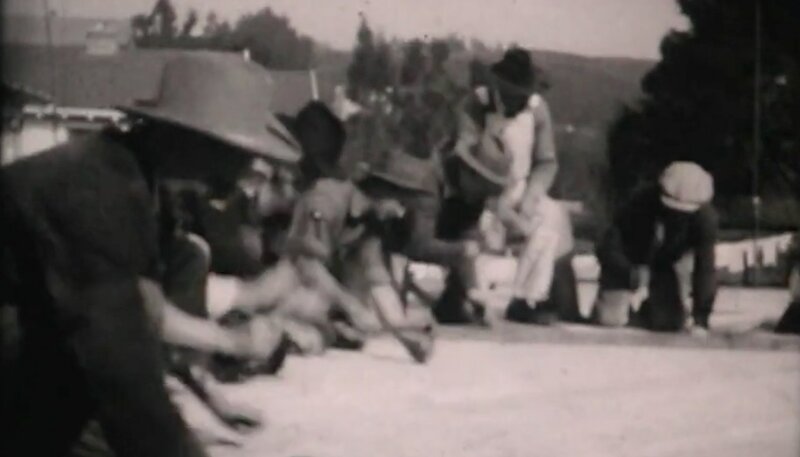 ​For now we are sharing the oldest known film footage featuring the Marin County fire service, a film from 1931 of building their own fire house. ​Rather than give up, the incorporated and private Corte Madera Volunteer Fire Department Ltd., including many successful local businessmen, decided to finance and build one themselves. They would include some office space for the Police Chief and Town Clerk to be rented back to the Town to help pay for it. They would also include an Assembly Hall, open for free to town groups like the Women's Improvement Club, in addition to a 15-year lease on the land to the Town. 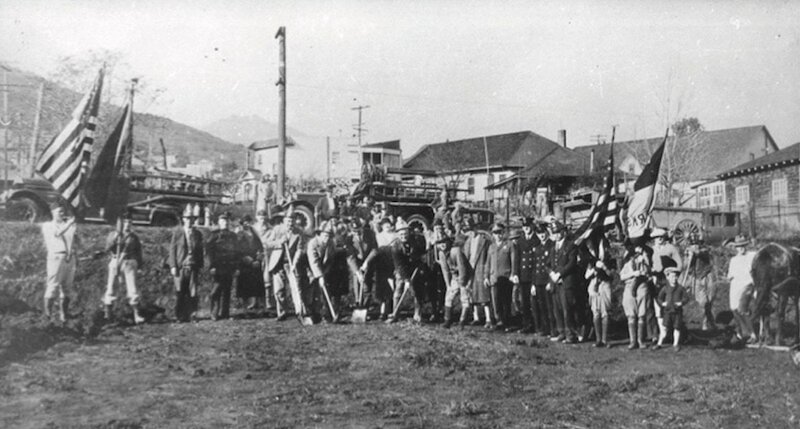 A groundbreaking ceremony was held on Sunday, January 18, 1931. It was described by the Petaluma Argus Courier as "..an impressive ceremonial." Representatives from civic and fraternal organizations, including Petaluma, were present. Neighboring Larkspur Fire Department firefighters joined the group with their 1922 Stutz Fire Engine. One of the ways the Corte Madera VFD raised funds was through operating the concession stand at the Larkspur Rose Bowl, owned and operated for decades by the Larkspur Volunteer Fire Department. Marin County Treasurer Charles Reading made the ceremonial address, applauding the "...progressive spirit of the Corte Madera department." The $8,000 fire house was financed and constructed by the volunteer firemen, under the supervision of a local contractor, Builder W.F. Wegner. "The Specialist" identified in the film at the top of the ladder is Mr. Wegner. This was of course in the days before nail guns, back when every nail was pounded in with a hammer. After completion of the new building, the film shows the last run of the first fire truck, from the old fire house in Menke Square next to the Episcopal Church. The first fire truck in Corte Madera, a 1916 Chevrolet Pope Hartford Chemical Wagon, is then parked in reserve in the basement level of the fire house, followed by the first run with the new fire engine down to the intersection of First Street (later renamed to Tamalpais Drive) and Chapman Drive. The new truck shown in the film was purchased one year before the depression, a 1928 American La France Type 91 500 gallon-per-minute pumper. This was the pride of the department for many years. The first run with all of the firemen is led by Corte Madera Police Officer Horstkotter on his motorcycle. As the engine responds out of the new fire house and down First Street with all of the firemen hanging on, they pass a large white home and lot that would in 1965 become the location of the new Public Safety Building. As the engine arrives and takes a fire hydrant for the first hose lay, note the open marsh area in the background and the vacant rolling hills. This area would become the Corte Madera Town Park many years later, with the Neil Cummins School built just to the north. The hills would later be filled with homes. You'll also see that home behind the men spraying water with the fire hose. ​Finally, the closing shot pans across the fireman in front of the new fire house, with most "having a smoke" for the camera, back when smoking was so common. The fire house was sold to the Town in September of 1953, and is still in use today as the Town Hall, with offices and the Council Meeting Chamber. In 1965, the FD would move to new quarters on the adjacent lot to the east, in a new Public Safety Building that is still in use as the main fire station. ​More of the CMVFD Ltd. story coming soon. Sources included: The Petaluma Argus Courier, The San Anselmo Herald, The San Francisco Call, The Oakland Tribune, and The Marin Independent Journal. The Corte Madera "Fire Boys" pose on their 1916 Chevrolet Pope Hartford chemical engine in front of the original fire house in Menke Square, adjacent to the Episcopal Church. The groundbreaking for the new fire house at the corner of First St. and Willow Avenue. First St. would later be renamed Tamalpais Drive. A scene from the film, featuring lots of hammering. The Larkspur Volunteer Fire Department's Rose Bowl, featuring outdoor dancing among the trees and the stars. 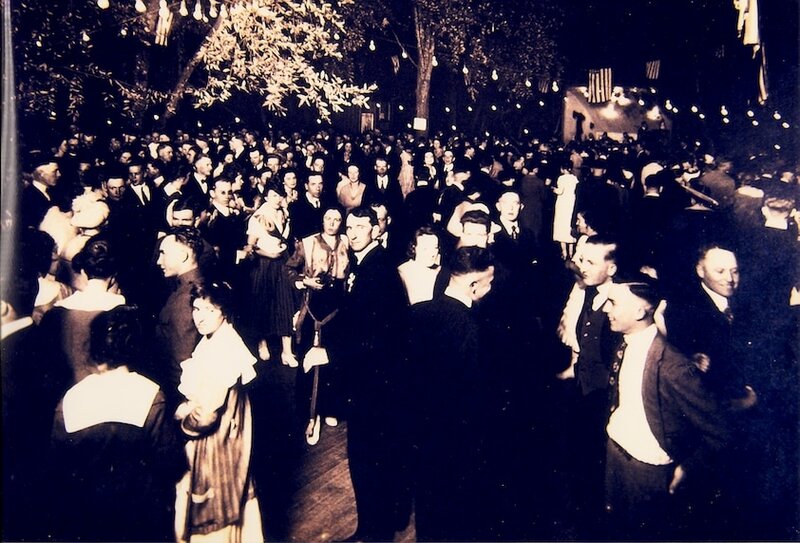 The popular venue completely funded the Larkspur Fire Department until 1957. The Corte Madera FD also worked for some of their funding here through the concession stand and special dance nights. In another clip from the film, some of the Corte Madera "Fire Boys" take a hydrant adjacent to the future home of the Corte Madera Town Park. 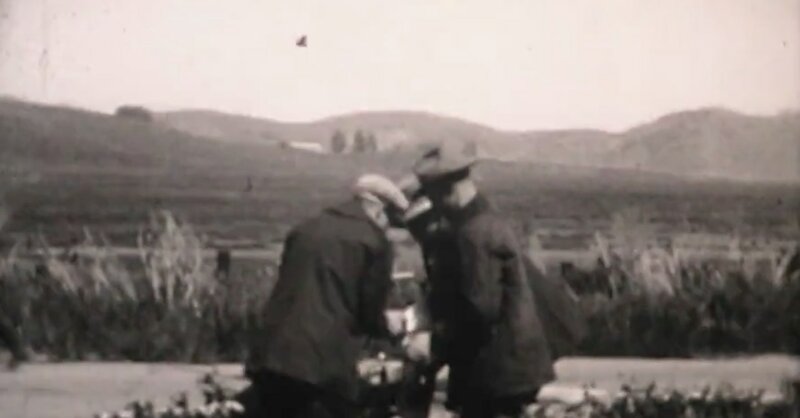 We believe this wonderful film below was shot by George Niven, a Larkspur businessman who lived in Corte Madera. He was the father of Jim Niven, a Larkspur Volunteer Firefighter tragically killed in 1978 while responding to a fire. Click on the symbol in the lower right to the left of the word vimeo for full screen. Thanks to the Larkspur Volunteer Fire Foundation for sharing this film. A mural for a New Years Eve Dinner held by CMVFD Ltd. on December 31, 1950. The mural was created and drawn by long-time Volunteer Fireman Stan Ferguson, who spent his career in editorial cartooning for the San Francisco Examiner. Image courtesy Corte Madera Volunteer Fire Department Ltd. historical archives.